We spent hours putting Hydro Flask and YETI insulated water bottles through a series of tests to help you decide which is best to keep your liquids cold or hot! Read on to find out why we think the YETI 18oz Vacuum Insulated Stainless Steel Bottle is the best insulated water bottle. Once found mainly in specialty sporting goods stores, in recent years, vacuum insulated water bottles have taken over the market. They are everywhere – everyone has one or wants one, and no one seems to be able to agree on which of the many brands is the best. Two of the titans of the vacuum insulated water bottle industry are Hydro Flask and YETI. Both enjoy immense levels of brand recognition and have plenty of loyal customers who swear that their product is the best on the market. With all the publicity hype and marketing campaigns surrounding both brands, it is hard to know which to buy and which will really perform the best. To answer these questions and recommend the best insulated water bottle for you, we spent hours reviewing and putting both brands through a rigorous series of standardized tests. The results of these tests allowed us to generate informed side by side product comparisons and ultimately select one brand as the manufacturer of the best insulated water bottle. Before we jump into the side by side product comparisons, let’s clarify what exactly a vacuum insulated water bottle is and how it differs from a standard single-walled water bottle. A single-walled water bottle has, as its name implies, one wall which separates the liquid inside from the ambient temperatures outside. By contrast, a vacuum insulated water bottle is actually like one bottle nested inside of another. The air in the gap between the nested bottles is vacuumed out and the gap is sealed. What makes vacuum insulated water bottles so superior and why should we use them? To answer these questions, we must understand a bit about how the physics of heat transfer impact both single-walled and vacuum insulated water bottles. With a single-walled water bottle, heat transfers between the inside and outside of the bottle relatively quickly by means of conduction, convection, and radiation. Fill a bottle with hot water and you will immediately feel the outer bottle walls get hot as a result of conduction. Leave a bottle of cold water in the same room as a space heater and the convection of the hot air moving past your bottle will warm the water. Place an icy cold bottle in direct sunlight and thermal radiation rapidly infiltrates the bottle, melting the ice. These rules change a bit in a vacuum however. In a vacuum, heat is not transferred by conduction or convection, but rather by radiation. With vacuum insulation, the sealed vacuum pocket between the inner and outer wall of the bottle acts as a buffer to prevent both heat conduction and convection between the inner bottle and the outside environment. The only way left which heat can be transferred is by radiation, and even that is slowed by the vacuum pocket between the inner and outer bottles. What does that mean for you? Vacuum insulated water bottles are specifically designed to maintain their inner temperature for much longer than single-walled models. Vacuum insulation keeps cold drinks cold and hot drinks hot for longer. The double-walled, vacuum insulated TempShield Insulation, the same technology used in all Hydro Flask products, will ensure that your beverage of choice maintains its temperature. From an aesthetics perspective, both products are visually appealing and they come in a wide variety of colors. When we held both bottles, we instantly noted that the YETI feels significantly heavier and seems to be of a better build quality. The Hydro Flask feels cheaper by comparison. We next compared the features of each brand. 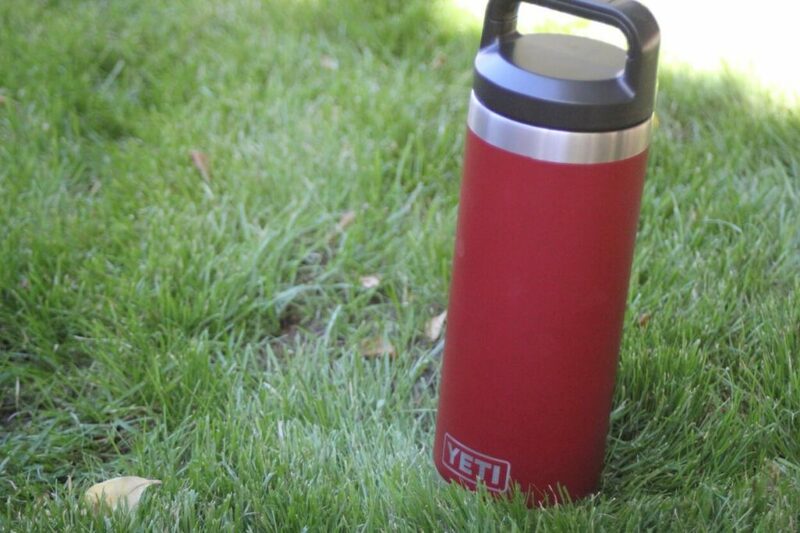 Right away YETI has an advantage for consumers looking for easy clean-up, since it is dishwasher safe. Hydro Flask products must be washed by hand. For what it is worth, Hydro Flask bottles come with a “lifetime” warranty while YETI products are warrantied for 5 years. That said, both warranties cover only manufacturer defects, making a lifetime warranty rather irrelevant. When it comes to customizability, with a variety of bottle sizes and colors, both brands come in a veritable rainbow of choices. When comparing pricing on the 18 ounce water bottles which we used in our tests, the price points are almost identical across brands with Hydro Flask coming in at $29.95 and YETI at $29.99. Be aware that the prices do increase with size and YETI’s prices go up pretty quickly as you get into the larger size bottles. Hydro Flask and YETI both use the same 18/8 stainless steel, double-wall insulated construction in their bottles. Finishes are slightly different with Hydro Flask utilizing powder coat for color and YETI going with DuraCoat™. 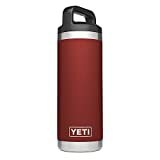 YETI bottles are also available in an uncoated stainless steel finish. One major feature difference between the brands is that while Hydro Flask comes in both standard mouth and wide mouth, YETI only offers bottles with a wide mouth. Both brands sell numerous add-on accessories like different caps and carrying holders. Our Hydro Flask bottle came with a flexible handle cap while our YETI featured a solid 3-finger grip cap. We found the grip on the YETI cap felt more natural. It was also easier to carry and to unscrew when tight. Looks are great, but they are only a small piece of the puzzle when it comes to choosing the best vacuum insulated water bottle. The most important criteria involve function – how well the bottle performs under real-world circumstances. How long does the bottle keep hot drinks hot? How long does the bottle keep cold drinks cold? How long does ice last inside of the bottle? What happens when we drop the bottle? How easily does the bottle scratch? If we drop the bottle in water, will it float? If you plan on carrying a hot beverage like tea or coffee in your bottle, you will want to know how long you can expect your drink to stay hot. To assess this we filled each of the 16 ounce bottles full of boiling water. The bottles were sealed and placed in a temperature controlled 75 degree Fahrenheit room. 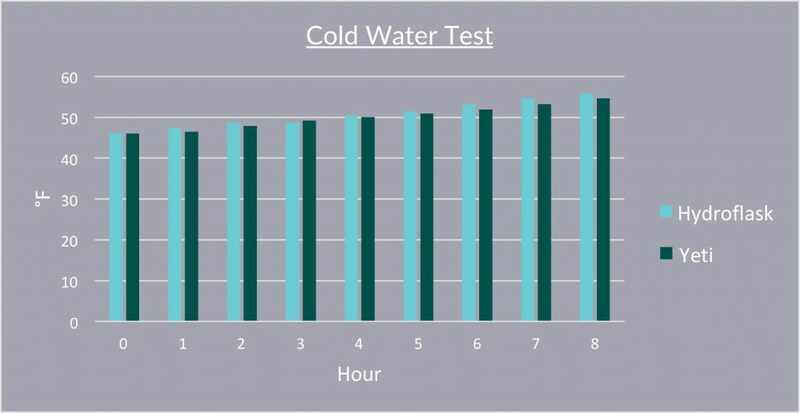 Water temperature was measured each hour for a period of 8 hours using liquid mercury submersible thermometers. The temperature in both bottles started out at 208.4 degrees F. At the 8 hour mark, the water in the Hydro Flask container was at 125.6 degrees while the YETI was 132.8 degrees – a difference of 7.2 degrees. When you fill your water bottle with cold water before heading to work in the morning, how cold can you expect that water to stay as the bottle sits on your desk all day? To assess the ability of the bottles to keep cold water cold, we filled both the Hydro Flask and YETI 18 ounce bottles full of cold, refrigerated water. 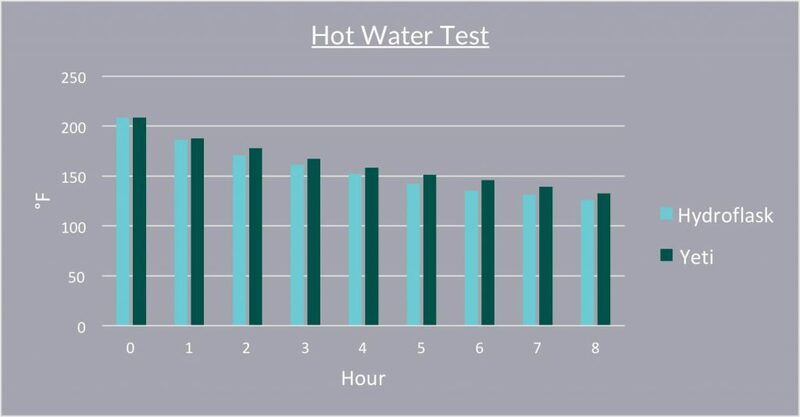 As with the hot water test, the bottles were sealed and placed in a temperature controlled 75 degree Fahrenheit room. 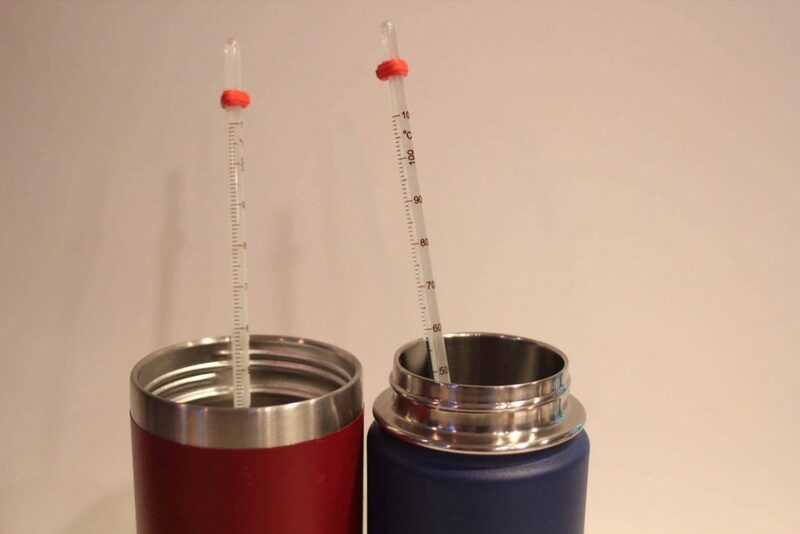 The temperature in both bottles started out at 45.95 degrees F. At the 8 hour mark, the water in the Hydro Flask container was at 55.85 degrees while the YETI was 54.5 degrees – a difference of 1.35 degrees. No one likes their drinks to get watered down by rapidly melting ice, so conducting a timed ice melt test was a crucial factor in determining which brand should win the title of best vacuum insulated water bottle. For this test, we placed 5 ounces of ice into each 18 ounce bottle. The bottles were sealed and left in our temperature controlled 75 degree Fahrenheit room for 24 hours. After the 24 hours, we measured the amount of ice melt in each bottle. While both bottles were able to keep the ice from completely melting after 24 hours, the Hydro Flask contained 3.85 ounces of water compared to 2.67 ounces in the YETI. This was a difference of 1.18 ounces which equates to a very significant 23.6%. Nearly everyone who is actively using a vacuum insulated water bottle will drop it at some point, so we wanted to know how bad the damage would be. 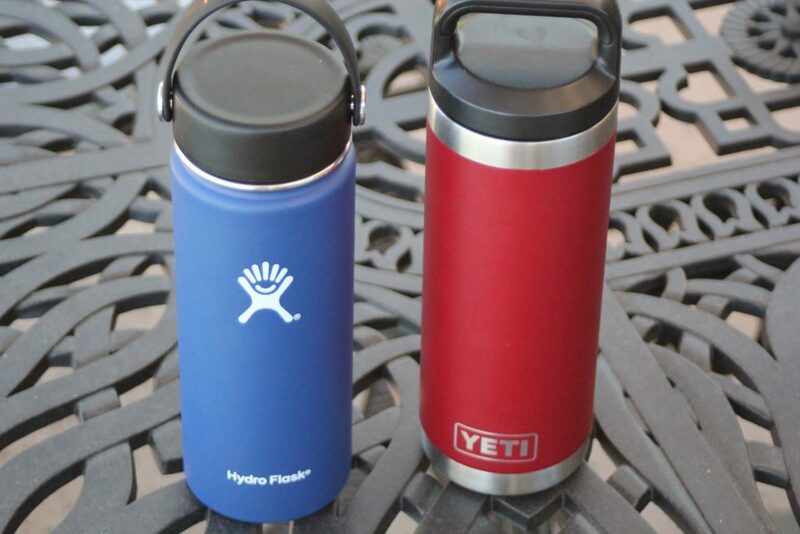 Both Hydro Flask and YETI list the same construction materials, so we were interested in seeing what difference (if any) there would be in damage caused by dropping. In our drop test, both bottles were dropped onto a cement sidewalk from a height of 5 feet. To observe the impact of different types of falls, we tested several variables: full or empty and landing on the bottom or landing on the lid. Bottles were dropped 4 times each: empty on the lid, empty on the bottom, full on the lid, and full on the bottom. During the tests, both the Hydro Flask and YETI bottles dented, however the Hydro Flask dented more significantly than the YETI. For both bottles, the most damage occurred when full and dropped on the lid. In this version of the test, the Hydro Flask lid flew off. After analyzing it, we realized that Hydro Flask lids have less threading than YETI lids, which may make them more prone to coming off on impact. When we dropped the full YETI bottle on its lid, the handle cracked. At some point your water bottle may get thrown in a gym bag with your keys or find itself in some other position where it is likely to get scratched. Does one brand’s color coating hold up better than the other in such circumstances? To test this, we scratched the surface of both the Hydro Flask and YETI water bottles using a key and visually compared the results. Despite the different types of color coatings, both products scratched easily and deeply. Vacuum insulated water bottles are designed for all kinds of active adventures including those that take place on the water. If you are planning to take your water bottle out on a boating or kayaking trip, you may be wondering whether it will float or sink if it goes overboard. We tested both bottles buoyancy by sealing them and placing them in a swimming pool. Both brands floated whether they were empty or full. After recording our first impressions, reviewing the features of each brand, and analyzing the results of our series of 6 tests, we sat down to choose a brand to crown as the maker of the best insulated water bottle. When the results are seen in graph form, the winner is clear. 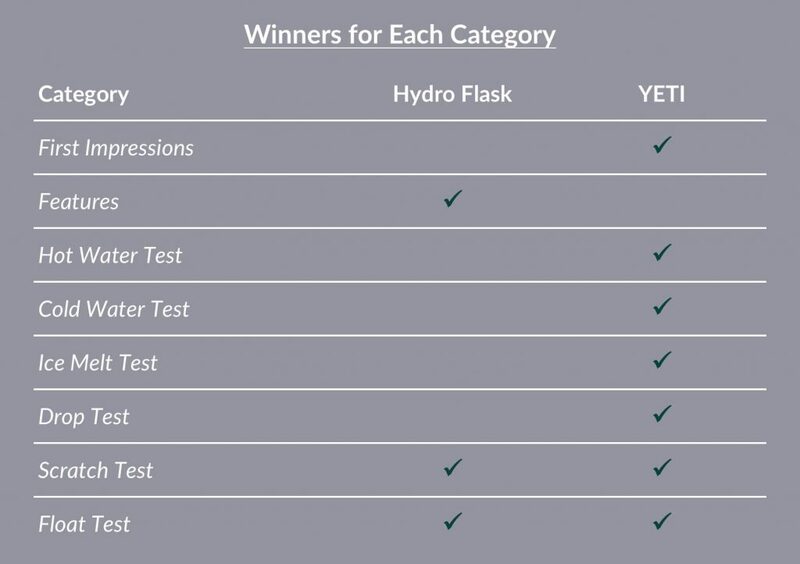 Hydro Flask won for features and tied for the scratch and float tests, but YETI won for first impressions along with the hot water, cold water, ice melt, and drop tests. 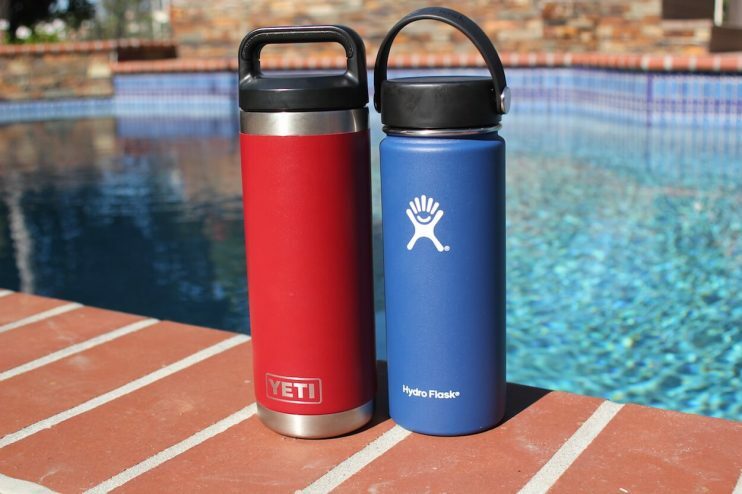 The areas in which the YETI stood out the most were the hot water test where it kept the water 7.2 degrees warmer than Hydro Flask and the ice melt test with an amazing 23.6% lower ice melt percentage than its competitor. For all these reasons, our choice for the best vacuum insulated water bottle is YETI. After you purchase an insulated water bottle, how do you care for it to maximize its lifespan? If it is dishwasher safe, such as the YETI, use your dishwasher to clean the bottle. Otherwise, cleaning the bottle by hand with soap and warm water is the best method. To make the process easier, fill the bottle halfway with water and soap, screw on the lid, shake, then rinse. You can also use a bottle brush to easily reach the bottom during your cleaning. Also, if available, register your product online. There are thousands of single-walled and vacuum insulated water bottles to choose from, however if you are looking for quality and performance, the choice is clear. YETI out-performed the other industry leader, Hydro Flask, in multiple side-by-side product comparisons. If you want your hot drinks to stay hotter and your cold drinks to stay colder, your ice to last longer, and your bottle to withstand more abuse, YETI is the best vacuum insulated water bottle for you!